Have you ever heard of Low Impact Paintball? 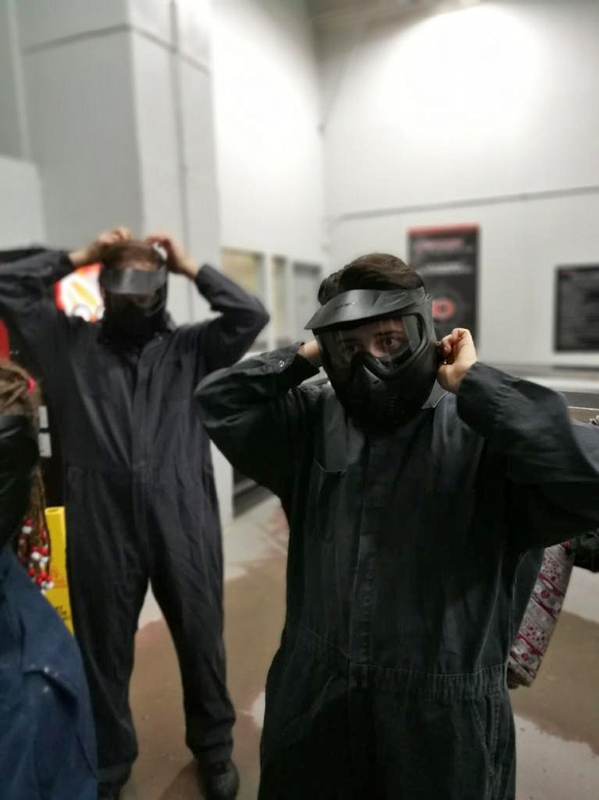 Well, we ventured to Defcon Paintball here in Toronto to experience their Low Impact Paintball recently. I am not sure I have ever shared how competitive my family is, well now you know, we are a rowdy and competitive bunch! 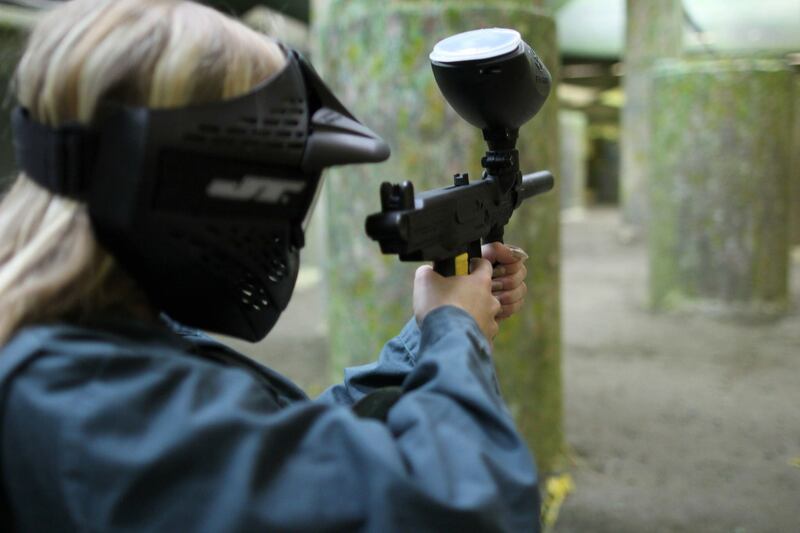 Defcon Paintball has two convenient locations in Toronto and Mississauga. They are ranked highest in customer satisfaction with competitive rates to give you the best value for your dollar! The fields at Defcon span over 40,000 sq-ft, executed by top set designers in the industry. I especially love that they provide top-of-the-line equipment, I only jammed my gun once and it was totally my own fault. Defcon also has an amazing Pro-Shop filled with all the latest gear for beginners to seasoned pros. If you are looking for an amazing time, Defcon is it! They are one of the fastest growing paintball facilities in the Greater Toronto Area for a reason. Low impact paintball, also known as microball, uses a smaller .50 caliber paintball and is suitable for players for ages 8+. 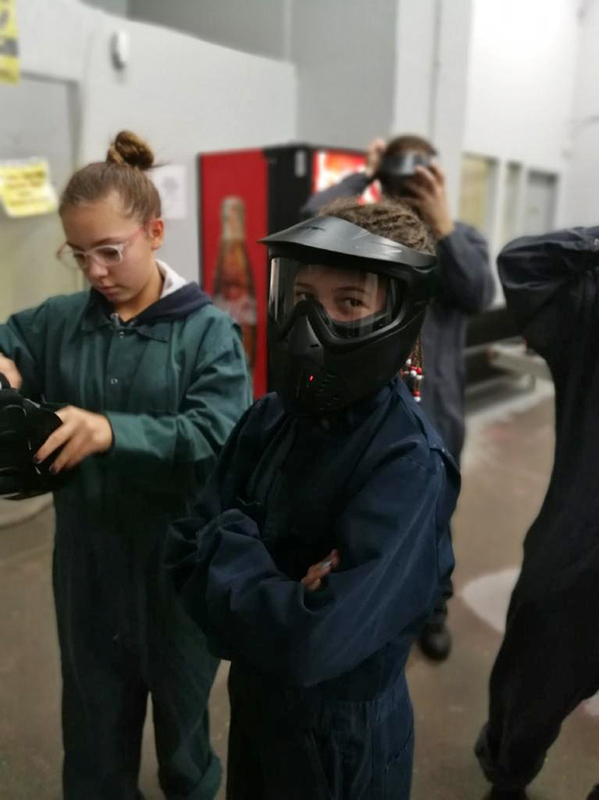 The smaller paintball allows for a more satisfying game experience and appeals to a broader range of participants without sacrificing the thrill and excitement! 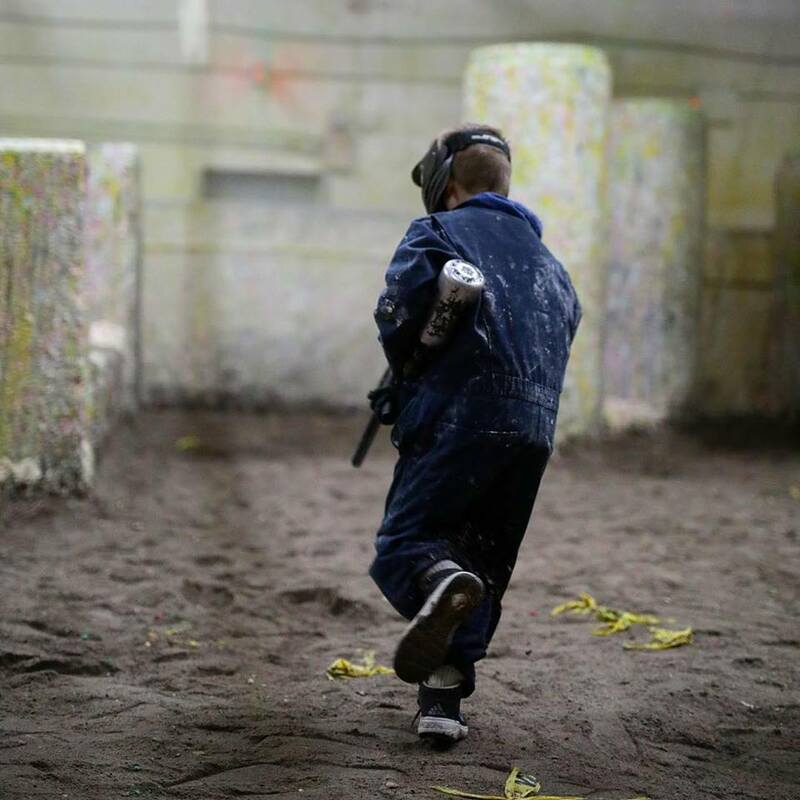 Defcon’s low impact paintball option appeals to the young, the new, families, parties and corporate events. 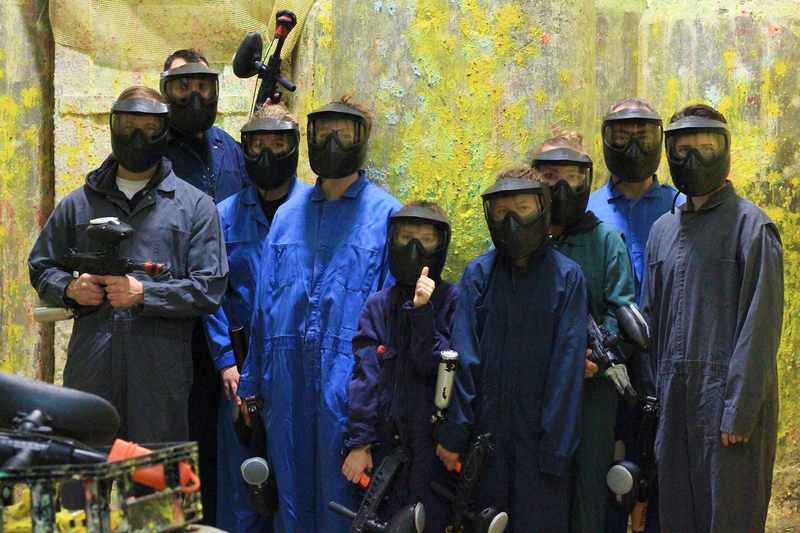 Low impact paintball at Defcon is exclusively available with an advance reservation. If you have a group of 15+ people you will have private field access. That means you get the course just to yourself for you and your group – perfect for birthday parties! 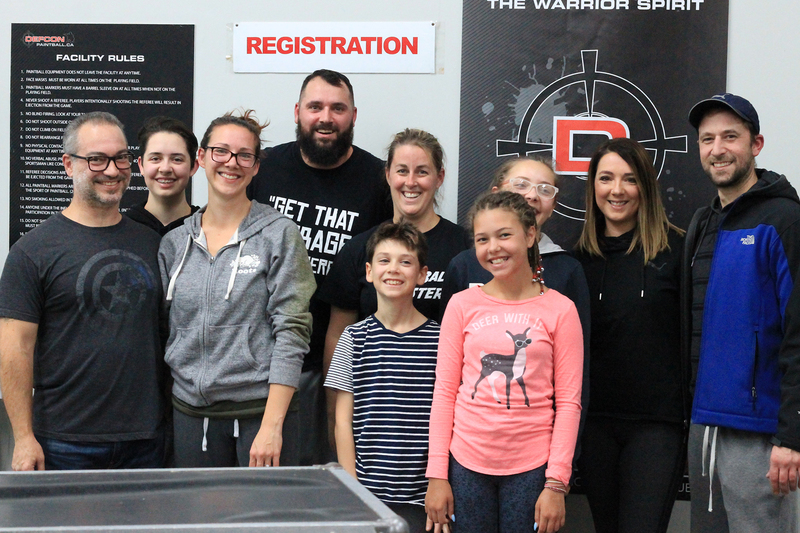 A few weeks ago my family all met up at Defcon Paintball in Toronto for a friendly (read competitive) game of low impact paintball. 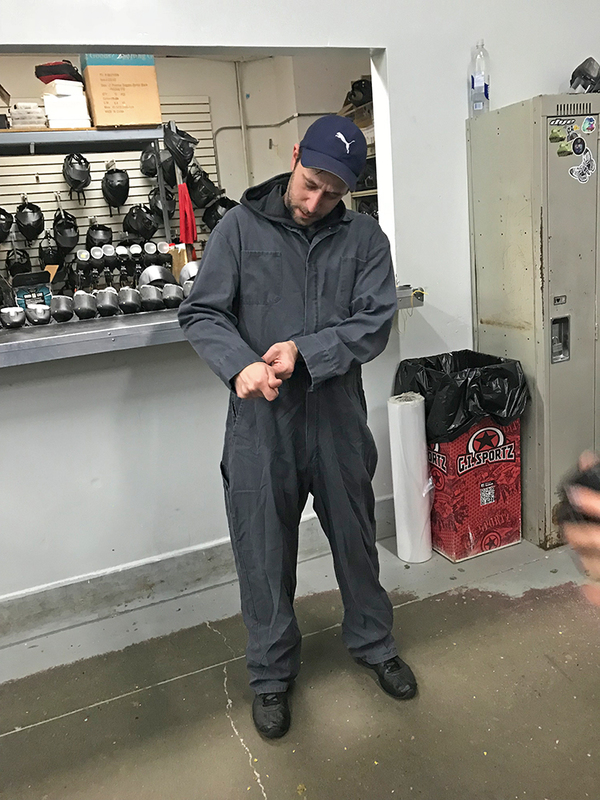 Upon arriving the manager Alex took us through the mandatory safety course, rules and then got us our gear. The ref took us through games such as capture the flag, attack and defend and my personal favourite, spouse vs spouse (with kids on each team). There is nothing like taking out some pent-up frustration on your spouse out on the paintball field! The adults did not show mercy on the kids or Steve, poor guy had his hands up more than anyone else. If you can’t tell by the picture below, my family holds nothing back. While I am behind the camera for this photo, make no mistakes, I totally had my game face on! Steve is pretty confident in this photo (front left), although the whole game he was annihilated. Out of our family, the only ones who have been paintballing before was my brother, sister and myself. We have done regular paintball in the past, but this was our first time experiencing low impact paintball! 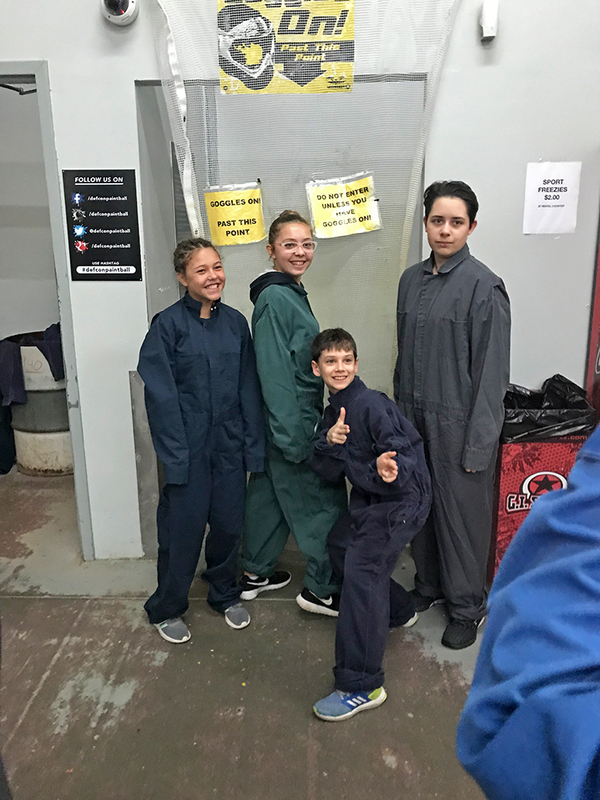 The rest of the fam jam were paintball newbies and although I told Steve it was low impact, he layered on the clothes thinking it would hurt. I wore a thin pair of leggings and a sweater under my jumpsuit so I could feel the “pain” of being hit. Well, I only got shot 3 times the whole night, told you I am competitive! Right at the end, it was a standoff between my brother and me, the only two left with ammo and both of us are ruthless. With guns blazing, we literally charged at each other and he shot me twice – once in each thigh. Don’t worry, I got him a few times too! It did not hurt at all, it more or less felt like someone flicked my leg with their fingers. I had no bruising from being shot in the days that followed either. When I asked the kids if it hurt when they got shot they all said no! We were clearly all flushed and sweaty from a good hour or so of intense competition! My family can’t wait to go back, my sister and her fiancé are even considering having a joint bachelor/bachelorette party there! 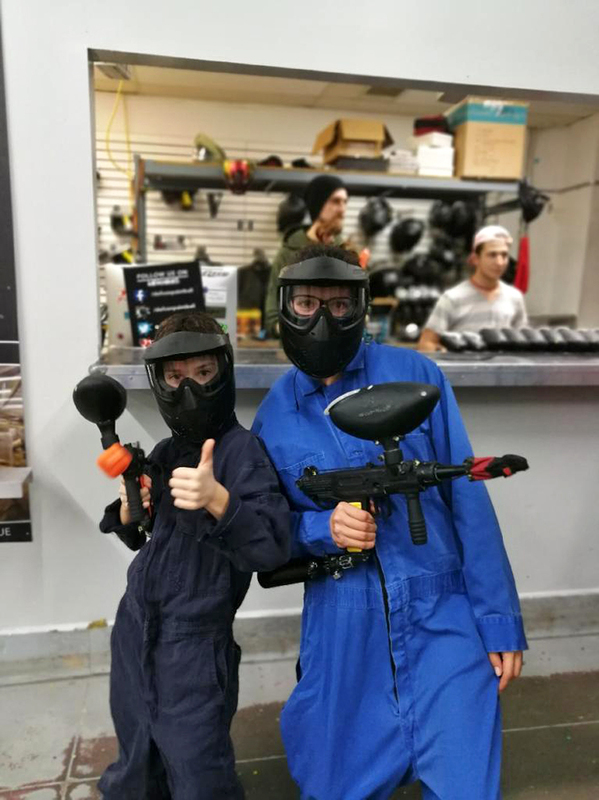 All of the kids also enjoyed it and have been asking when we will be planning our next family paintball night. Defcon Paintball has offered an exclusive discount code for my readers. Save 15% off bookings with code ECM15 at checkout! The discount code is valid until May 30, 2019. Follow Defcon Paintball on Facebook, Instagram and Youtube. You can also visit their website to book your paintball experience! My friends at Defcon Paintball have generously sponsored a special giveaway for my readers! 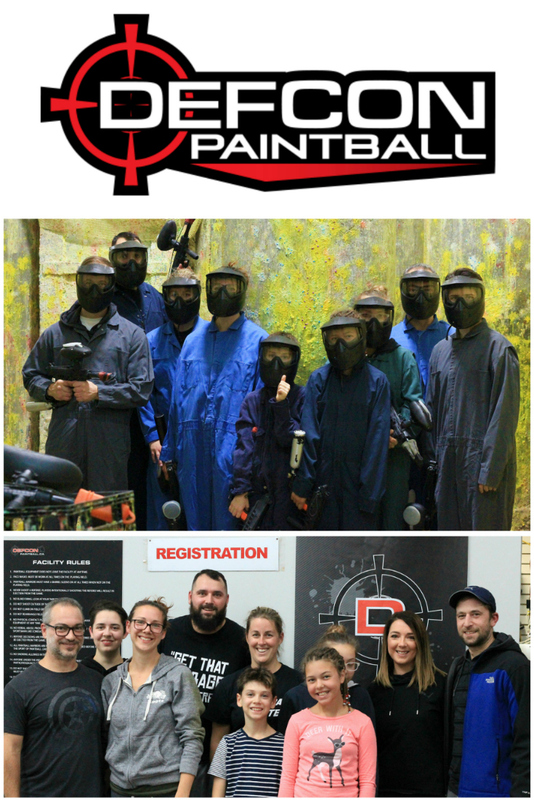 (1) Elite Low Impact Paintball Package at either the Toronto or Mississauga location for 10 people valued at $650! 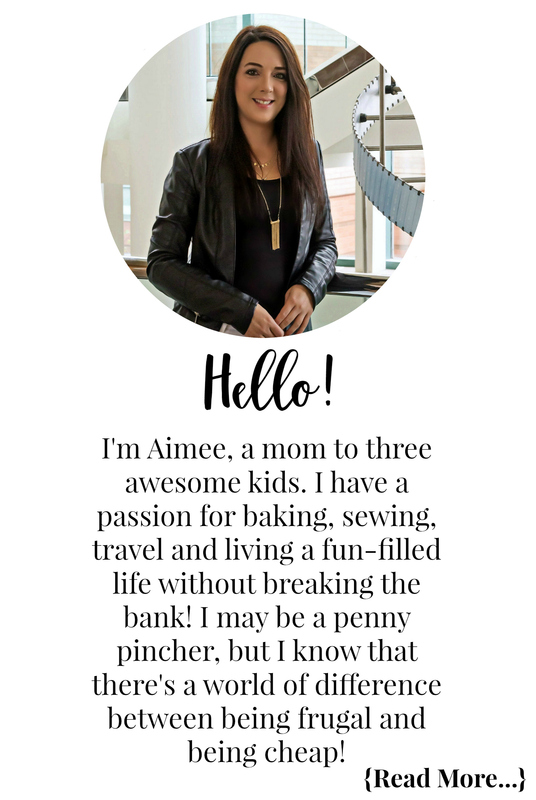 This giveaway is open to Canadian residents LOCAL TO TORONTO who have reached the age of majority. To enter the giveaway, complete the mandatory entry options in the giveaway widget below. Once you have completed your mandatory entries you will be able to complete additional non-mandatory entry options. Complete those for additional ballots in the giveaway! This giveaway will close on December 13, 2018, at 11:59 PM EST. The winner is drawn from all eligible entries and will be contacted via email on December 14, 2018. The winner will have 24 hours to respond to the email and claim their prize. 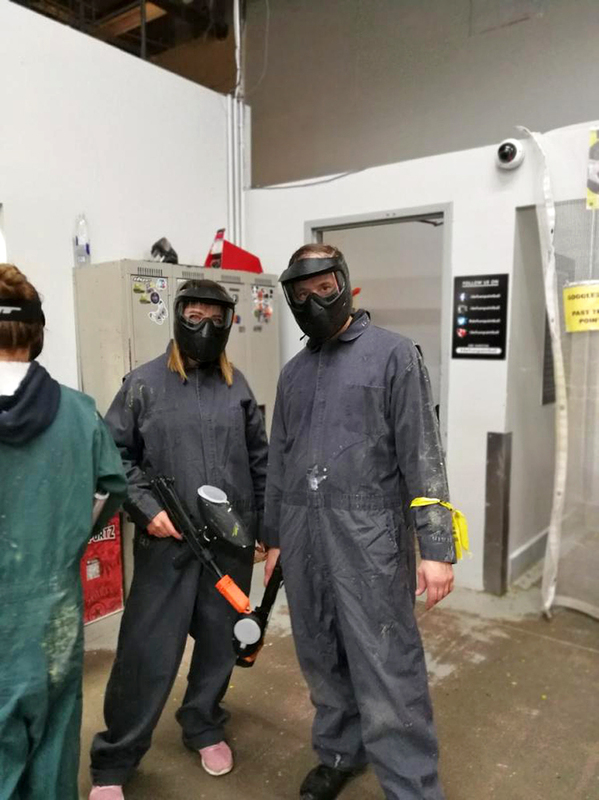 Disclosure: This post is sponsored by Defcon Paintball, the opinions and language are all my own, and in no way, do they reflect Defcon Paintball. Any product claim, statistic, quote or other representation about a product or service should be verified with the manufacturer, company, provider or party in question. I’ve always been too scared of the pain to try paint ball but this looks great. My husband is most competative! I have never tried paint ball but would love to take my son. We are very competitive with each other. You’d be surprised, low impact is virtually painless. Within the first 5 minutes of the first game I got hit on bare skin (top of my finger) and it didn’t hurt at all 🙂 On the other hand, regular paintball does sting a bit, you’d probably enjoy the low impact and have more fun than laying there and getting hit HAHA! I have never been but would love to go with my family. I think my husband and I would be the most competitive! I have never tried paint ball before but it looks like a lot of fun! I’m the most competitive in my family!! I’ve played once and my dad is the most competitive! I used to go to paintball when I was younger. I LOVED it!! So much fun ! I have never been paint balling but it looks like soo much fun! My husband can get quite competitive! My husband and his friends go to paintball. Would love to win this for them! Maybe I’ll join them too! Never went their .but will love to take my kids their .and my self to have so fun. I’ve never been. My husband and my son are both pretty competitive! No, I’ve never tried paintball and the most competitive person in our family is my grandson. I have never played paintball, but my husband has bought these tickets for us to try it out. Looking forward to it. I would have to say I would be the most competitive. I have only played paintball once and it was a few years ago. My oldest daughter is the most competitive in our family. I have never played paintball before. My boyfriend is definitely the most competitive! I have never played paintball but I definitely am the most competitive person in our home. Bring it on. No, but my brother would be competitive. Never played paintball in my life but would love to. We are all pretty much competitive! I have never tried paint balling before, but have heard that it is tons of fun! I am also not very competitive. I think my bf would be the most competitive one if we went to play! I’ve never played but think it would be fun. My 10 year old would be interested and we are all too competitive. In this case though my husband would be the worst. I played once and was so scared but it ended up being fun. A huge bruise was my take home prize lol. Only my husband has tried it but that was over ten years ago. I’m by far the most competitive in the house!